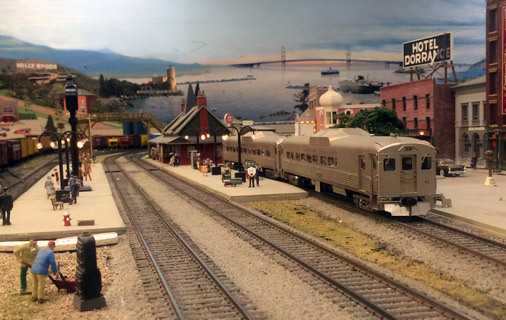 Welcome to the virtual tour of the Detroit model railroad club layout. With this tour we hope to give you a better idea of our objectives and accomplishments. We have been working on this, our sixth and “final”, railroad since 1974. We never expect to get the railroad "finished" because we are continually changing it as we get experience operating it. Our major sources of income are membership dues and revenues from the public open houses. You can find the dates for this year by clicking on "open house" in the main menu. Our club's model railroad is called the Detroit Union Railroad and is being built in "O" Scale, which is 1/4 inch to the foot. 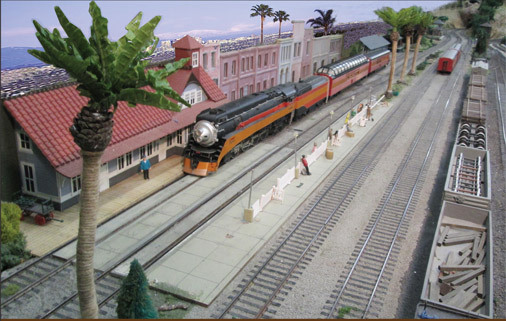 The popular Lionel trains (which started many of us in model railroading) are roughly the same size as "O" Scale, but they are not exact scale models. Upon entering the building, you first see the recently built Dorrance Manufacturing Complex (DMC). This area is loosely patterned after facilities such as the Chevrolet Manufacturing Complex in Flint, Michigan. The first building that has been constructed in DMC is representative of automotive stamping plants around the country. When completed, the DMC will contain several more buildings representing an automotive parts manufacturing complex. Next, visitors see the city of Dorrance. The city is named after Perry Dorrance, the first president of our club, and is the western terminal of the Detroit Union Railroad. 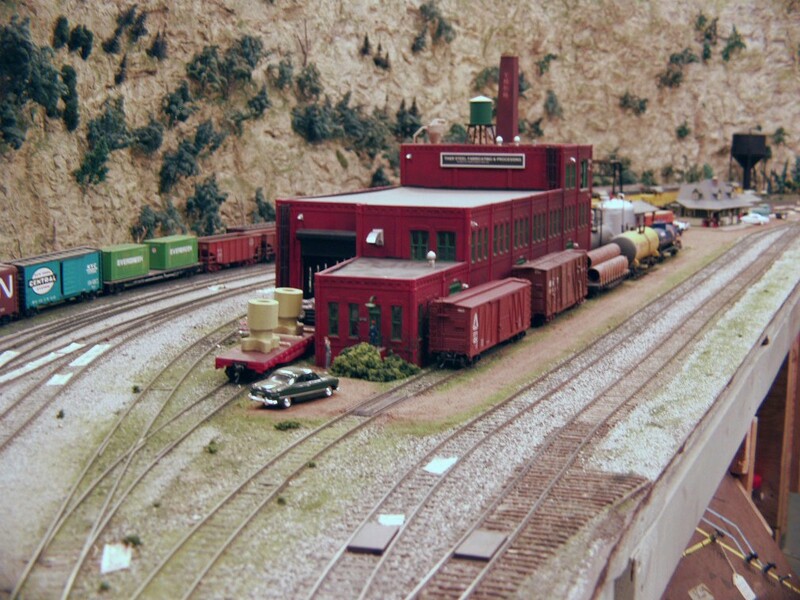 Many structures are in place including a roundhouse, station, Railway Express Agency (REA), car repair building and the Duncan Junction switch tower. 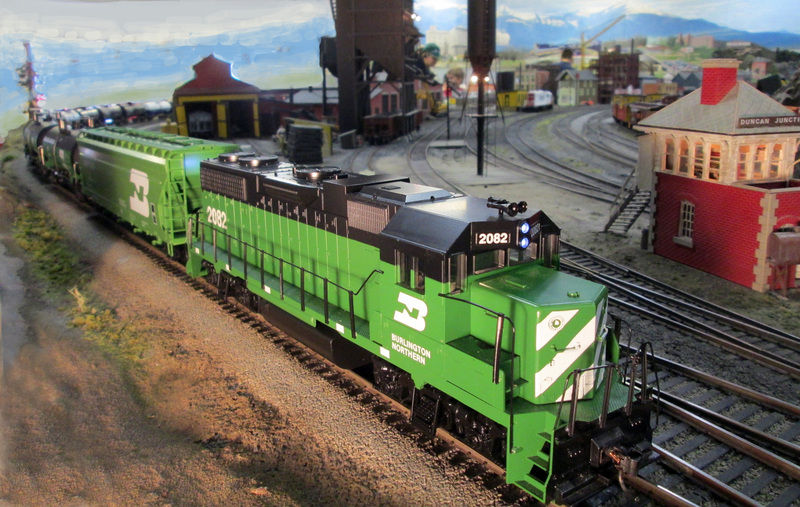 Operating facilities at Dorrance include a passenger coach yard, freight yard, and a self-aligning turntable. All of these facilities and structures have been built in place "from scratch" by members of our club. Many additional structures will be built in the town as time and budget permit. The Detroit Union Railroad is patterned after the union railroads of several mid-west cities such as Cleveland, Cincinnati and St. Louis. 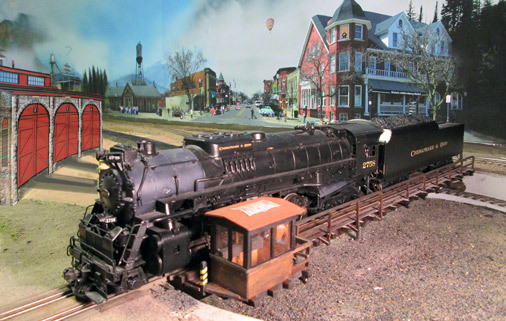 Multiple railroads serving a city would organize a union railroad, which was jointly owned and provided a single set of tracks into the city that all the owning railroads would share. Detroit never had a union railroad, however several railroads serving Detroit used the old Fort Street Union depot. As the trains proceed eastward (to the right of the building by railroad direction), they operate on about 350 feet of double track mainline as they head toward Detroit. As the train departs Dorrance, it passes Duncan Junction, where the passenger yard mainline meets the double track mainline. 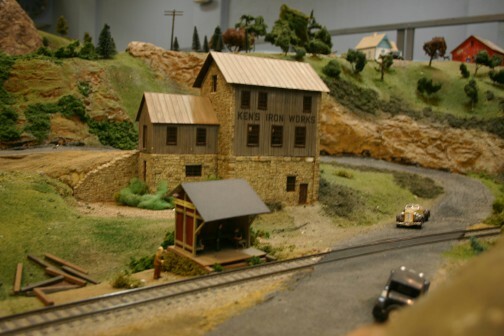 This area includes some of the outstanding scenery features of our railroad, including rock work, trees, stumps, a hobo or two, and a bear that roams the area we call Bear Mountain. After rounding the curve past Bear Mountain, the train progresses downgrade toward a valley, passing the Dorrance Signal Bridge. 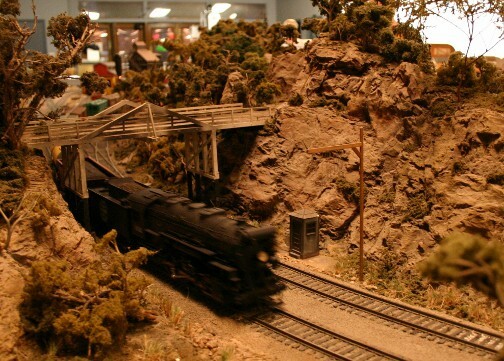 The train then passes behind the mountain on the far side of the railroad and emerges again heading through Nichols Crossing. The train then heads under Bear Mountain and comes out of the tunnel to heading towards Pierson's Farm. 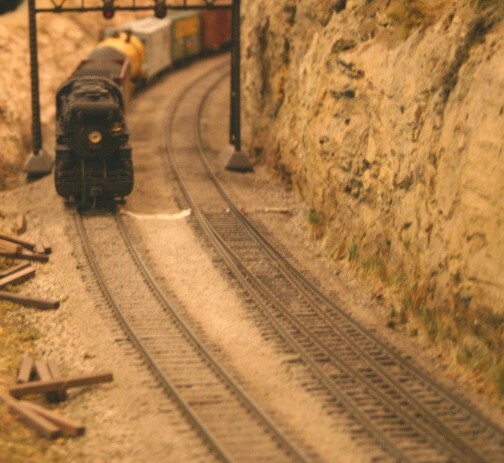 The train continues into a curved tunnel and emerges next to the town of Hammondsport. Hammondsport is one of two towns in this valley (the other being Keatington across the aisle). Both of these towns are serviced by our branch-line railroad. Keatington is also serviced by our single-track railroad. These towns provide "revenue traffic" for the railroad and allow for interchange of passengers and freight. After passing Hammondsport, the train enters another tunnel, and emerges at Walkerville, where the double track mainline, the single track and the branch line run parallel for a short distance. From Walkerville, eastbound trains head into Detroit. Detroit is in the lower level of our redesigned theatre, and has undergone major renovation that began in earnest in 2010. The previous ‘temporary’ Detroit (which was in place for about 20 years) was removed during the 2014 construction season. Detroit currently contains four arrival-departure tracks and six classification tracks as well as extensive running track. Additional track-work is currently being built with additional classification tracks, a caboose track, engine servicing facility, roundhouse, passenger terminal, and industrial tracks still to come. In Detroit, the train may either pass through town and return up the westward track of the double track mainline, or it may run through to the single track mainline. If following the latter route, the train then heads out of Detroit and into the valley after obtaining dispatcher clearance. In the valley is Mohan Mine. Clearing the valley, the train heads into Keatington. Keatington is the interchange between the single track and branch line. Goods and passengers can be unloaded off trains on the single track and then be loaded or board trains on the branch line. 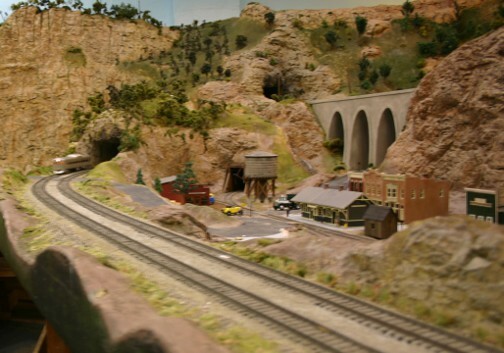 After leaving Keatington, the train heads into a tunnel and emerges in the tiny town of Smith's Creek. Once the train exits Smith's Creek it runs on the single track parallel to the double track in Walkerville. 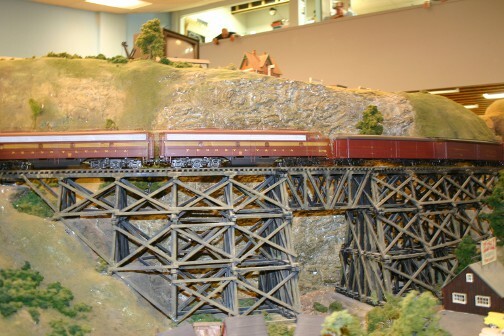 The train then makes several upgrade loops and heads over the Curved Trestle and into the Power Plant. The power plant uses coal from the Mohan Mine. Once the train leaves the Power Plant, the train heads up the toughest grade on the mainline and into Arletha, crossing the diamond interchange with the branch line as the branch line heads into Millersburg. The train enters Maguire, where it crosses the double diamond interchange with the double track railroad. In Maguire the train heads into the eight-track storage yard called Summit. Trains can be yarded in Summit, or travel on to Dorrance via Ripper Junction. Trains traveling westward on the double track at Maguire may proceed to Summit or up the ‘helix’ to the town of Beck, located directly above Summit. When completed, Beck will be the home to several industries, which will use and produce many freight-car loads of goods. At the far end of the building is the town of Millersburg, which is the terminus of the branch line and serves a large coalmine in the area. Millersburg is also the interchange with the narrow gauge line. 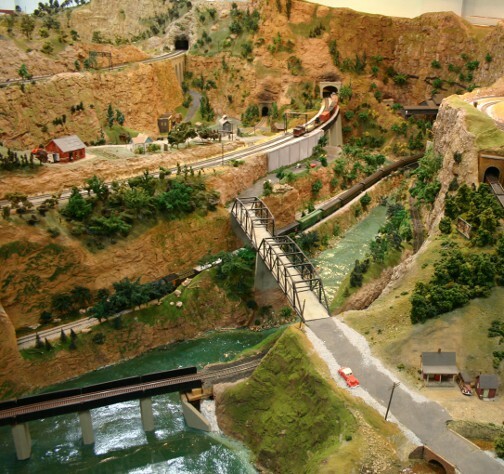 The town includes some dual gauge track and a coal processing area. The club meeting room is located above Millersburg, and contains our extensive model railroading library as well as the dispatcher’s office. The dispatcher runs the mainline. Traffic does not move on to or across any of the main-line railroad without permission of the dispatcher. This is the way the real railroads operate. In spring 2004, we switched the railroad from Direct Current (DC) control to Digital Command Control (DCC). Each locomotive is equipped with a decoder (a small circuit board containing a microprocessor) that is programmed to a certain number (usually the road number of the locomotive). Each engineer carries a throttle that can be set to send commands through the rails to the specific locomotive the engineer is controlling and allows him to control the speed and direction of his train just like in the real world. The engineer communicates with the dispatcher using an FRS radio. With the addition of DCC we have added sound to our layout as well. We look forward to you visiting our club.